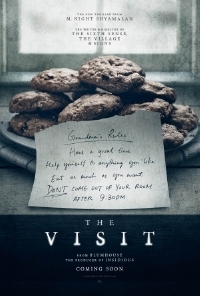 It's been a long time since M. Night Shyamalan directed anything good and though his adaptation of "Wayward Pines" is looking pretty promising, I can't say the same thing for The Visit. We were optimistic when the first poster and description were revealed last week but now that the trailer is here, I'm not so sure. The movie centers on two kids who go and visit their grandparents for a week only to discover that grandma and grandpa are a little crazy. Or there are weird supernatural things going on. Or a little of both. Shyamalan seems to be working on a fairly constrained budget, not too surprising considering the recent string of flops, the stories of overspending on "Wayward Pines" and the fact that Blumhouse's business model is work cheap for maximum return. The aesthetic isn't a detractor if used well but it doesn't seem to be adding anything to the story here and overall, it only adds to The Visit looking like every other low budget found-footage indie. What's worse, there's nothing here that suggests it's a breakout hit.